"The Union fleet's attack on Fort Sumter began on April 7, 1863, and continued on and off throughout the remainder of the war. There were eleven major and minor bombardments of the fort, attacks by small boats, and shelling from land and sea. Fort Sumter never surrendered. It was held tena­ciously until February 1865 when the end of the war was certain. 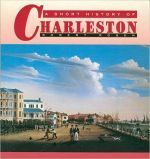 "But during the spring and summer of 1863, Charlestonians still thought they might win the war. They and the Confederacy had determined that Charleston would never surrender. And the siege of Charleston, which had begun in April with the attack on Fort Sumter continued. In July 1863, after weeks of secret preparations on Folly Island and Coles Island, the Union Army attacked strategically important Morris Island, which protected both Fort Sumter and Charleston Harbor. The island was really a sandbar, but, in terms of lives, it was an expensive piece of real estate in 1863. The goal of the attack on Morris Island was Battery Wagner, a fort near the tip of Morris Island that commanded part of the harbor and a main ship channel. With Wagner intact, no base would be available to the Union Army from which to launch an attack against Charleston. 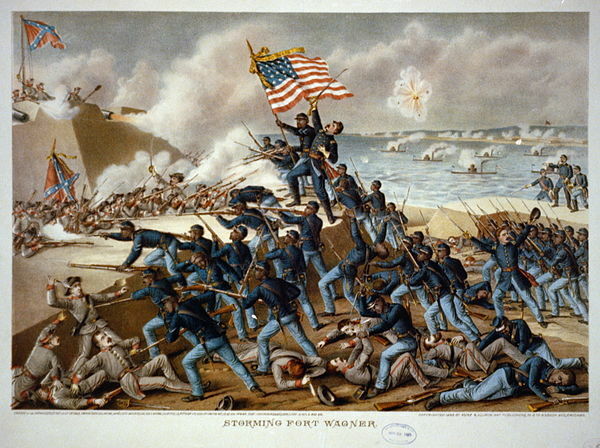 "The assault on Battery Wagner lasted from July 10 to July 18, 1863. "Losses were heavy on both sides, but Union losses were especially heavy. Some of those killed belonged to the 54th Massachusetts, a regiment of black troops led by white officers and commanded by the aristocratic Bostonian Robert Gould Shaw. "The 54th Massachusetts had been organized in the wake of the Emanci­pation Proclamation in 1863 by Governor John A. Andrews of Massachusetts, a zealous abolitionist who promoted the then unpopular idea of using black troops. It was to be 'a model for all future Colored Regiments.' Shaw, the 25-year-old Boston Brahmin and battle-seasoned veteran of Cedar Mountain and Antietam, accepted command. The regiment departed from Boston's flag­ draped streets in May, arrived in Hilton Head in June, and arrived on James Island in July. "Robert Gould Shaw was buried by the Confederates on Morris Island, with the dead of his regiment, or, as the Southern press described it, in a ditch 'with his niggers.' Northern reaction was vehement, and many insisted Shaw's body be buried with dignity elsewhere. Shaw's father, however, wrote General Quincy Adams Gillmore, the Union commander, that 'a soldier's most appropriate burial-place is on the field where he has fallen.' "